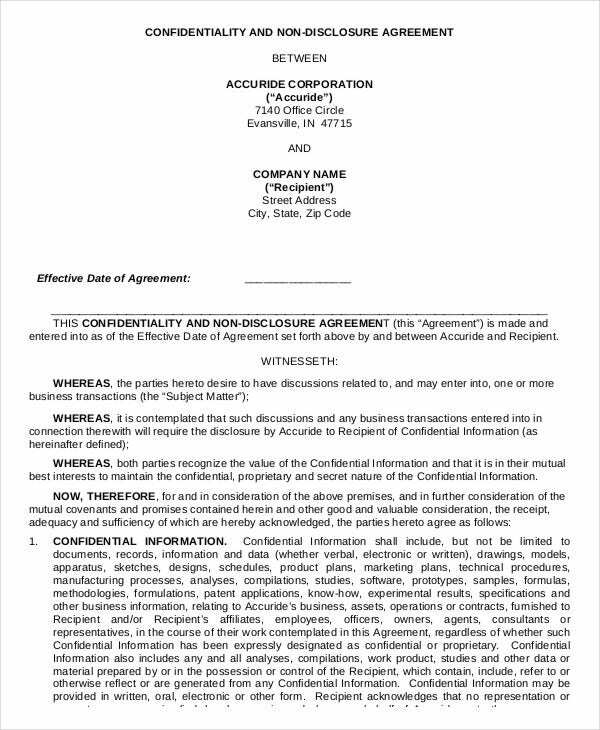 A confidentiality agreement is a great way to prevent disclosure of sensitive data. It could be intellectual property rights or trade secrets of your business. When you disclose a sensitive data to someone, you are always at the risk of the receiving party sharing the information, either willingly on the sly or unmindfully. 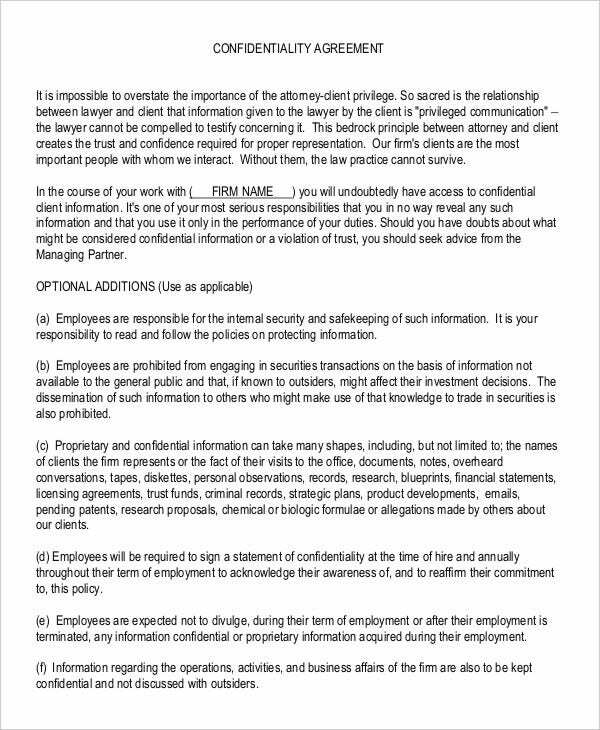 But a confidentiality agreement form eliminates such risk by clearly defining the duties of the receiving party regarding the protection of confidentiality of such data. 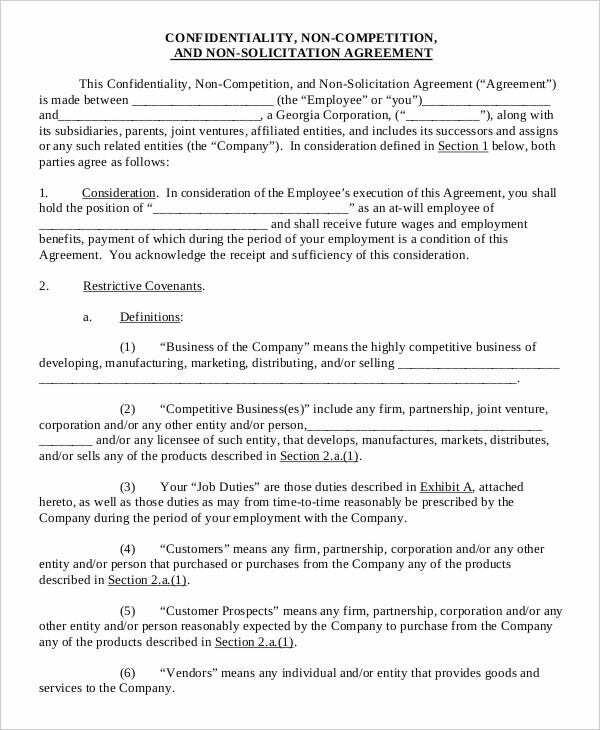 You have an elaborate Employee Confidentiality Agreement Template here that begins with the declaration of the agreement between the two parties and discusses in detail about confidential data and the employee’s duties regarding the protection of confidentiality. 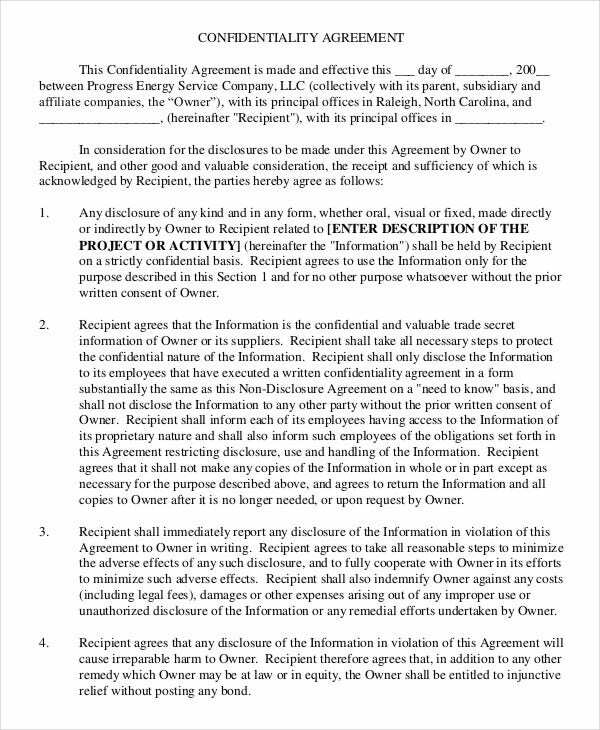 This tStandard Confidentiality Agreement Form includes the obligation of the employee regarding the maintenance of the confidentiality of the data confided to him- and also specifies the term of such a contract. 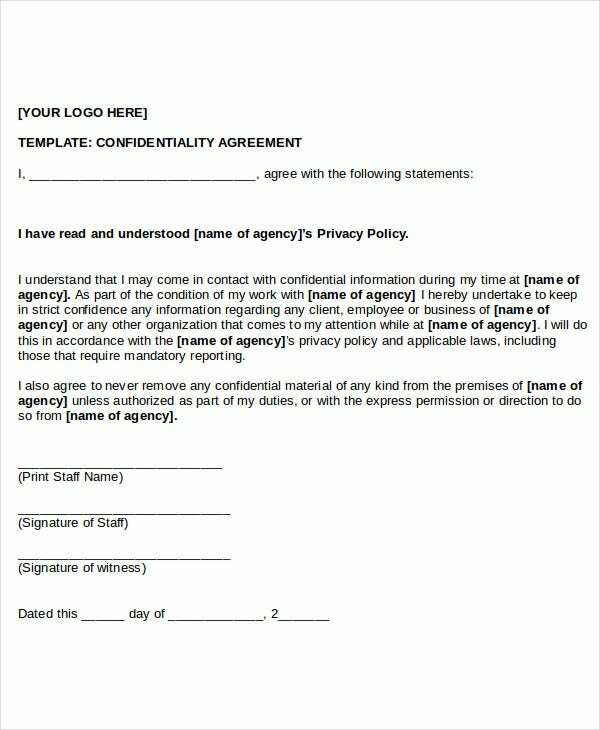 This Confidentiality Agreement Template will be helpful when you are planning to draft an NDA agreement with your employee as it houses all the terms and conditions to be maintained by the latter regarding the protection of confidentiality of your data. > What is the Importance of the Confidentiality Agreement Form? Your employees are the force of your business and hence you have to share your trade secrets with them. But there could be rotten apples in the basket who might jeopardize your competitive edge in the market by leaking the secret facts of your business to unwanted people. A confidentiality agreement form is one of the most important things that you need here as it enables you to legally certify to your staff that what kind of information he is obliged to keep private while working for you. The agreement would also enable you to take legal steps against the employee if he does something otherwise. 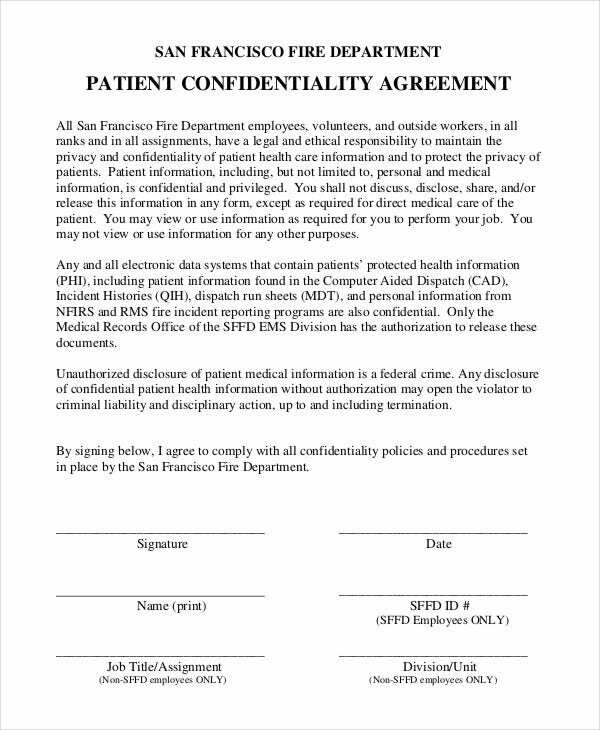 You have a standard medical Confidentiality Agreement Form here where a volunteer readily agrees to follow all the steps required to protect any confidential information received from the organization. The form concludes with signatures of the volunteer and the witness. > What is Included in a Confidentiality Agreement Form? 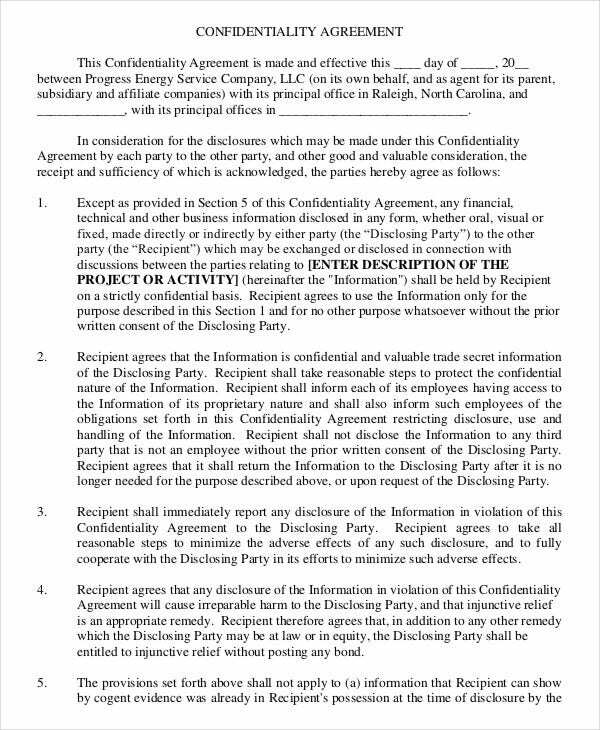 A confidentiality agreement form would generally begin with a declaration that such a contract is being made between two parties. One of the most important components of the agreement is the clear definition of data that is to be kept private. Then, the form would also state what are the duties and obligations to be maintained by the party receiving the confidential information, say your employees. 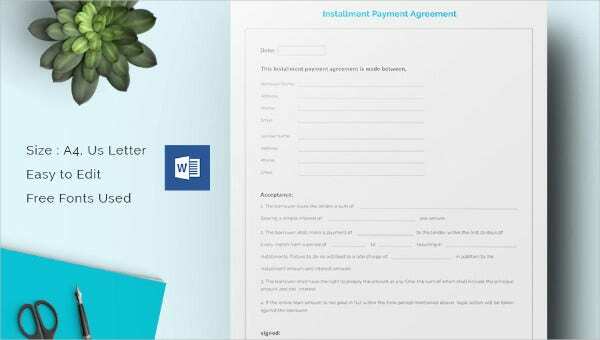 Besides, some of the Free Confidentiality Agreement Templates specify the time-period of such a contract. 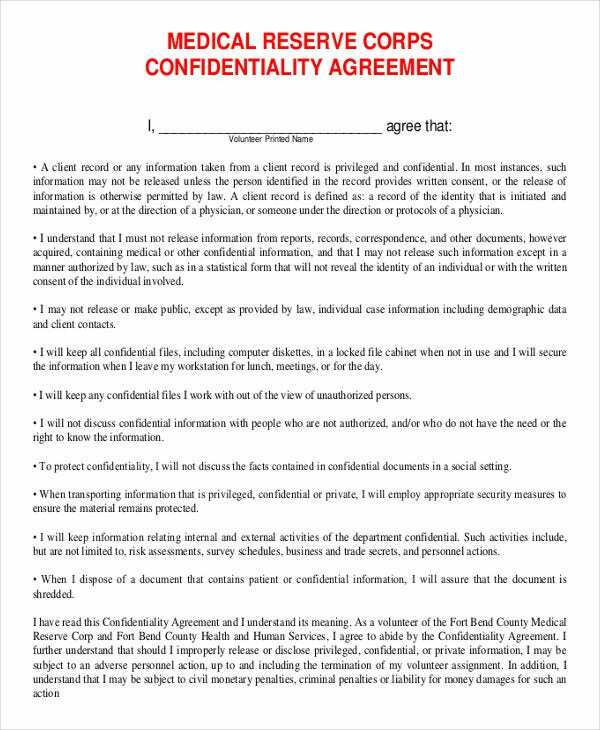 Moreover, these contract forms might also include what kinds of data are excluded from the terms of confidentiality. Are you looking for help in drafting a confidentiality agreement form? Well, in that case, you can have a look at the templates above as they have come up with readymade confidentiality agreements so that you don’t have to start everything from scratch. All of them can be customized easily.